Uighurs across the globe on Wednesday urged Beijing to release videos of their relatives in China's Xinjiang province to ensure the safety of their loved ones. Under the #MeTooUyghur campaign, which started on Twitter, Uighurs worldwide asked Beijing to release videos of relatives that they have not heard any news from. Muhammad Atawulla, an Uighur, is one of those seeking information from China about his relatives in northwestern Xinjiang, an autonomous region of the country. "As you did with our famous singer Abdurehim Heyit, show my Father, Mother and brother's videos, too! Show me if they are still alive!" Atawulla posted on Twitter. Chinese state media on Monday released a video showing Uighur poet and musician Heyit apparently alive after reports surfaced of his death in prison, where he was sentenced to eight years in 2017. Emin Kasım, an Uighur living in Istanbul, also asked China to post a video of his father-in-law. "Having no limits in cruelty, Chinese government! What profession do you teach my 73-year-old father in law in training camps?" Kasım wrote on Twitter on Tuesday, referring to the "re-education camps" in which some 1 million Uighurs are being incarcerated. Meryem Sultan tweeted a photo asking Beijing to put her in contact with her friends and family. Sultan said she wants a video of her mother, who she said got 15 years in prison despite being innocent. Turkey on Sunday slammed Chinese authorities' systematic assimilation policy for Uighurs, with Foreign Ministry spokesman Hami Aksoy calling it "a great embarrassment for humanity." 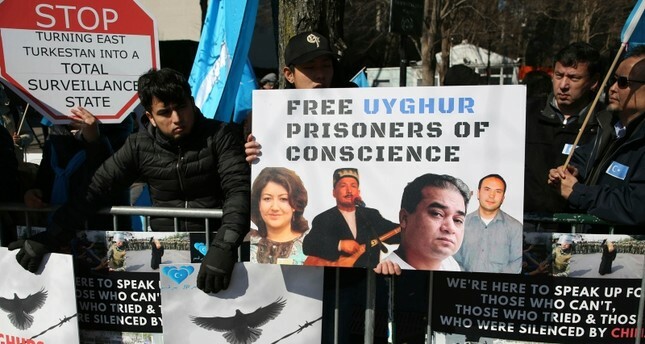 "It is no longer a secret that more than one million Uighurs— who are exposed to arbitrary arrests — are subjected to torture and political brainwashing in concentration centers and prisons," Aksoy said. Turkey urges Chinese authorities to respect the Uighurs' fundamental human rights and shut down concentration camps, Aksoy said. "We also call on the international community and UN secretary-general to take effective steps to end the human tragedy in Xinjiang," he added. Up to 1 million people, or about 7 percent of the Muslim population in Xinjiang, have been incarcerated in an expanding network of "political re-education" camps, according to U.S. officials and U.N. experts. In a report last September, Human Rights Watch accused the Chinese government of a "systematic campaign of human rights violations" against Uighur Muslims in Xinjiang. According to a 117-page report, the Chinese government conducted "mass arbitrary detention, torture and mistreatment" of Uighurs in the region.